There’s nothing like a good four letter word, right? It can express an emotion and energy that’s hard to get across any other way. And of course, the well-timed four-letter word can actually make an impact on everyone around you. 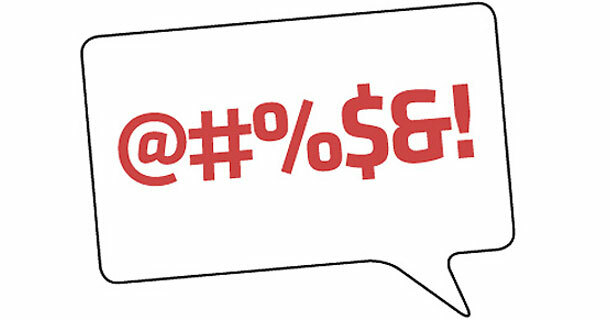 Oh wait–did you think I was talking about swear words like #%&@ and #(%^? Well, I have been known to use a few of those (usually when I’m caught in Atlanta traffic). But in my quest to help us reinvent our workplaces and wear our red capes all the time, I’m discovering powerful four-letter words we need to use more often at work. Here are my favorite four letter words–the ones I think are the most powerful. Suit up and try them out today! When did brag become a four-letter word? I’m always amazed how many accomplished, smart professionals think that it’s inappropriate to share how accomplished and smart they are. They hold back–and get left behind, or get left out of the opportunities where they can really shine and make a difference. All for our hesitation to brag. Or maybe we misunderstand what bragging really can be. To me, when you’re bragging with your red cape on, you’re simply sharing the things you’re proud of; things you’re excited by. If you’ve ever attended one of my “Communicating Your Value in the Workplace” talks or seminars, you’ve gotten a first-hand taste of how this can work. It never fails–when I ask people to brag to each other about something they’re proud of or excited by, not once has the other person thought it sounded like bragging. Not once. Recently, I shared an article on my Facebook page by Tony Schwartz, the author of [amazon_link id=”1451610262″ target=”_blank” container=”” container_class=”” ]”Be Excellent at Anything: The Four Keys to Transforming the Way We Work and Live.” [/amazon_link]Tony’s article in the Harvard Business Review blog commented on the recent controversy over air traffic controllers napping at work, and shared great data about the importance of rest and sleep. But we’ve demonized rest in the workplace. An exhausted client said to me the other day, “I can’t tell anyone I need a break–they’ll think I can’t handle it.” The reality is, though, that without breaks and rest, we won’t be able to handle it–even the things that come easy to us get more difficult when we’re beat. If you want to change your experience in the workplace, try building in some rest for yourself, and being a role model for others who will appreciate–and benefit from–your example. I spoke to a group of State Farm execs earlier this month about simple ways to find and create new ideas in their business, using a formula I’ve developed and tested called CARPE. What they found is that talking about what they cared about really mattered in generating new ideas and actions. One participant shared, “It’s amazing to realize that no matter how different we are and no matter what’s going on in the organization, we can all find things we care deeply about.” What could you create if you acknowledged what you really cared about at work–and started telling others? Love may be the most forbidden word in today’s workplace. But why? It is one of the strongest motivators in the human condition. You’d think organizations would have figured this out so far, since they’re spending millions on ideas and tools to motivate today’s employees. But maybe all it’ll take is a little bit of love. How would your workplace change if you brought more of your love into it–for your product or service, your customers, co-workers, even your competition? You don’t need to use the word out loud if you’re not ready, but remember, you can always show your love–a smile, a surprise action, a thank you does wonders. What are your favorite four-letter words to use at work (the relatively clean ones, okay)? Share them here or tell us about them on the Red Cape Revolution Facebook page!